Taylor N., Muller, J., and Vinjevold, P. 2003. 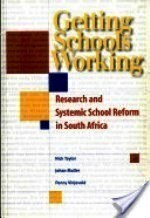 Getting schools working: Research and systemic school reform in South Africa. Pearson South Africa. This book had its origins in the President's Education Initiative Research Project. Getting Schools Working provides a sustained reflection and meta analysis of suggestive information about the state of education in South Africa based on a survey of education research between 1998 and 2002. The authors review this knowledge base systematically and provide an analysis of school improvement efforts, as well as a detailed discussion of the kinds of research, both empirical and theoretical, that go beyond common sense and suggestive trend data to reveal systemic implications for future research and school reform programmes. The result of this systematic review is a model of the factors that influence learning at school in South Africa. The review and the model brought together in Getting Schools Working constitute a valuable resource for researchers, policy makers and practitioners in the field of education.